This year’s renewal of the £100,000 Group Two Sky Bet York Stakes (3.10pm) promises to be another superb race after 21 horses were entered for the highlight of racing at York this Saturday, July 28. Group One winner Planteur is set to head to the Knavesmire for the extended 10-furlong contest following excellent efforts in some of the world’s premier middle-distance contests. The Marco Botti-trained five-year-old currently heads the betting with SkyBet at 5/1 alongside the Luca Cumani-trained Afsare, a Group One runner-up in Italy earlier this season. Planteur beat Sarafina, Cirrus Des Aigles and Cape Blanco in the Group One Prix Ganay at Longchamp, France, in April, 2011 and finished strongly to take third in the Group One Dubai World Cup at Meydan, Dubai, in March this year. He was third on his European return in the Group One Prix d’Ispahan at Longchamp in May before fading to seventh in the Group One Prince Of Wales’s Stakes at Royal Ascot on June 20. Botti revealed: “Planteur is a likely runner in the Sky Bet York Stakes at the weekend. We want to check the ground and as long as it’s not firm ground and it’s safe he will take his chance. “He has been in good form since his run at Royal Ascot. He will have had a bit more time between races when he runs at the weekend and I think that is what he wants. I think he is a horse who likes to be a little bit fresh, but he looks well and I have been happy with him. “I was a little bit disappointed with his run at Ascot but, for some reason or another, he did the same thing the year before and maybe the three weeks between the Prix d’Ispahan and the Prince Of Wales’s Stakes was not enough time for him. “Unfortunately, it was the only day at Royal Ascot when the ground was on the quick side of good and that didn’t help. It’s also a possibility that he doesn’t like Ascot, so his performance could have been down to a number of things. Botti may also be represented in the Sky Bet York Stakes by 20/1 chance Marcret, who won the Group Three Huxley Stakes at Chester on May 10 prior to coming home fifth behind Side Glance over an extended mile in the Group Three Diomed Stakes at Epsom on June 1. The trainer added: “We will keep an eye on the race for Marcret and see how many runners there are because it would be a big ask for him. “He is a very genuine horse who always tries his best and I’m sure York will suit him better than Epsom, but it’s a very competitive race and we will just see how many declare before making a decision on Thursday. Sir Henry Cecil won last year’s race with Twice Over, who returned to York for a famous victory in the Group One Juddmonte International a month later. The trainer could be represented this time by another Khalid Abdulla homebred, Jet Away, an easy nine-length winner of a conditions race on the Knavesmire in October. The five-year-old, an 8/1 chance with Sky Bet, beat subsequent Group Two winner Fiorente in a Goodwood Listed contest in May but could only finish third in another Listed race over a mile and a half at Pontefract on his latest start on June 24. Lord Grimthorpe, racing manager to Khalid Abdulla, commented: “Jet Away is likely to run in the Sky Bet York Stakes. He has been in great form recently and he is dropping back to his correct trip on hopefully his preferred ground as well. 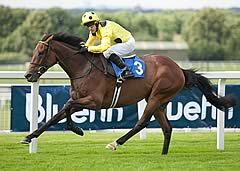 Colombian, a Group Three winner at Sandown in April, could line up for in-form trainer John Gosden, while fellow Newmarket handler Michael Bell has entered French Group Two victor Allied Powers and Wigmore Hall, who scored in the Grade One Northern Dancer Turf Stakes in Canada last season. Godolphin captured the Sky Bet York Stakes with Stage Gift (2007) and Kirklees (2009) and the racing operation has four entries including the Mahmood Al Zarooni-trained Dubai Prince, a ready winner of a nine-furlong conditions race at York on July 13. Perennial Group One performer Sri Putra and Pekan Star have both been given entries by Roger Varian, while other notable potential contenders include the Hughie Morrison-trained Sagramor and Ransom Note, a Group Two winner for Charlie Hills. A seven-race card, sponsored entirely by Sky Bet and sportinglife.com, also features the fiercely competitive £50,000 Sky Bet Dash (3.45pm) and the 34 entries for the six-furlong handicap include recent Newmarket heritage handicap scorer Fulbright, who is one of three co-favourites at 10/1 with Sky Bet.